Providing a mission statement shows your potential employer your goals and where you see yourself in a few years. Is your professional mission to publish groundbreaking research, or to use the latest in education research to help mentor more students in mathematics? These are just two possible examples of a mission an early career academic might have. You can also use it to align yourself to a university's beliefs. If you are really strategic, you will even tie it to the department you are hoping to join. Highlight how your mission will strengthen theirs. Write out your mission statement, and how you plan to achieve this mission before sharing it in interviews and on documents. If you can, include it with a visual plan and diagram, which can make you an even more memorable candidate. Make sure to start on a job posting site that reflects your career choice, then immerse yourself in the job search: make sure the keywords of job openings are reflected on your resume or CV. You may need to have multiple versions to fit different types of job searches and increase your chances. Set up a weekly schedule to look up new positions being posted and the lifespan of other postings. 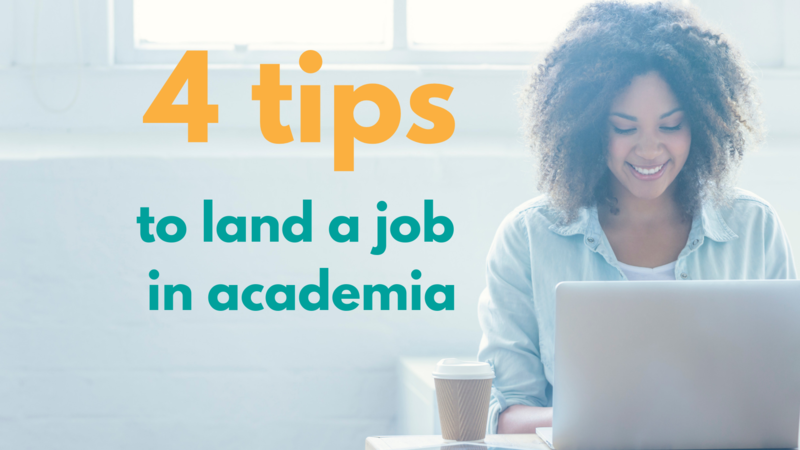 Keep in mind that academic hires are focused on finding someone with the right “fit” for the institution, such as your area of research, or even personality. While you are searching through job openings, begin to think about how you may fit into the department and institution as a whole. Once you find your dream job opening, be sure to include how you will enhance the department in your application. Universities are going to be focused on your publishing success while you were earning your Ph.D. Make sure to get a mentor that helps prioritize paper-writing, and if not, have a conversation with them about your publishing goals. Early publishing success is a factor potential employers use to predict publishing in the future, so be prepared early on to produce papers. It’s not enough to teach effectively in a traditional classroom. Universities are adding more digital courses each semester and they need faculty who are fluent in the technology, pedagogy, and working with students who typically enroll in online classes. Gaining experience in teaching online courses that keep students engaged can set you apart from the competition. Talk to your department chair about online teaching opportunities. No matter where you are in your academic career, set a plan for your career goals and job search, and stick to it. Getting started on these goals early will ease the stress. Browse faculty positions today.